cacy of our two-stage solution approach using a case study. a medical emergency within a predefined time standard. quired coverage consistently over the entire service area. two-stage solution approach to this problem is developed. and some future work are outlined in Section 7.
babilistic, and therefore, more realistic models [5-11]. servers required to meet the availability requirement. Probabilistic Location Set Covering Problem (Q-PLSCP). a priori and then use it as an input in the model. and may depend on both server and customer . in response to demand fluctuations by time and space. abilities, hence, they called their model TIMEXCLP. worst case departure from optimality was merely 2%. gies for 95% of all cases. riod, hence implicitly minimizing vehicle operating costs. number of crews assigned during the planning horizon. demand must be reached within 10 minutes 59 seconds. sponse to fluctuating demand throughout the day. it possible to solve using heuristic algorithms. to find the maximum coverage with a given set of servers. loop (meets or does not meet the average requirements). and location of the servers for all time intervals. ing the Jarvis’ algorithm within Equations (2) and (3). cantly reduces the solution times. feedback throughout the search. Similar to Gendreau et al. based on the best coverage as calculated by Equation (3). selected after which the first ambulance is selected again. not use Jarvis’ algorithm for each ambulance relocation. the full ISA with RTS. spectively. Let wk be the weight for shift k.
on a Dell PC Pentium IV 2.4 MHz with 512 MB RAM. respect to maintaining coverage with fewer ambulances. quality for 16 of the 40 problem instances. tedious series of decisions EMS administrators must make. the region into 2 mile by 2 mile square nodes (zones). Table 1. Average coverage (%), CPU times (sc) and frequency of difference between RTS and RTSLAP fleet sizes. Table 2. 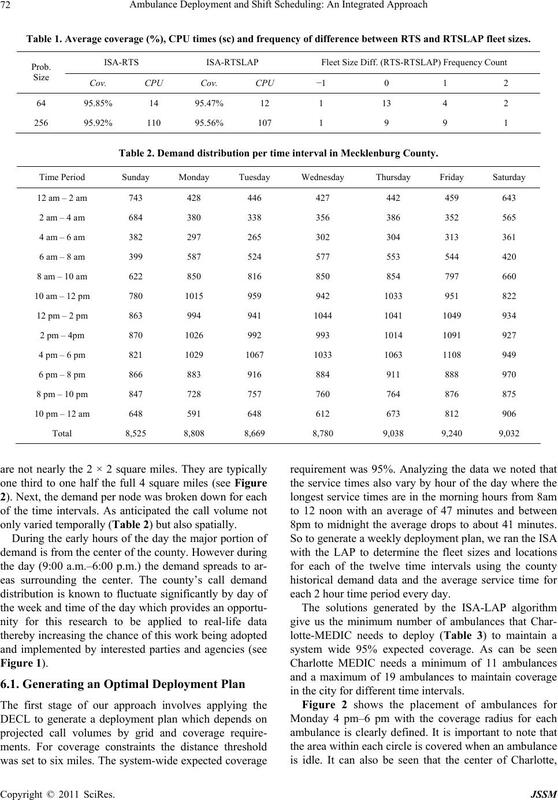 Demand distribution per time interval in Mecklenburg County . 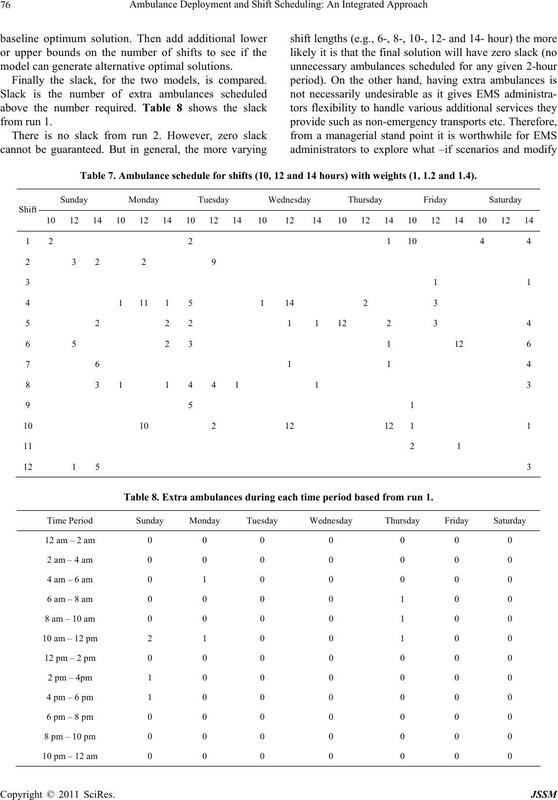 only varied temporally (Table 2) but also spatially. 8pm to midnight the average drops to about 41 minutes. each 2 hour time period every day. in the city for different time intervals. Figure 1. Distributions of calls (Mondays 4-6 & 6-8a am). Figure 2. Ambulance locations generated by DECL. several more servers than the outskirts of Charlotte. DECL which is always greater than the threshold of 95%. This is due to the fact that coverage is a constraint. Table 3. Number of ambulances required to meet the 95% coverage requirement. Table 4. 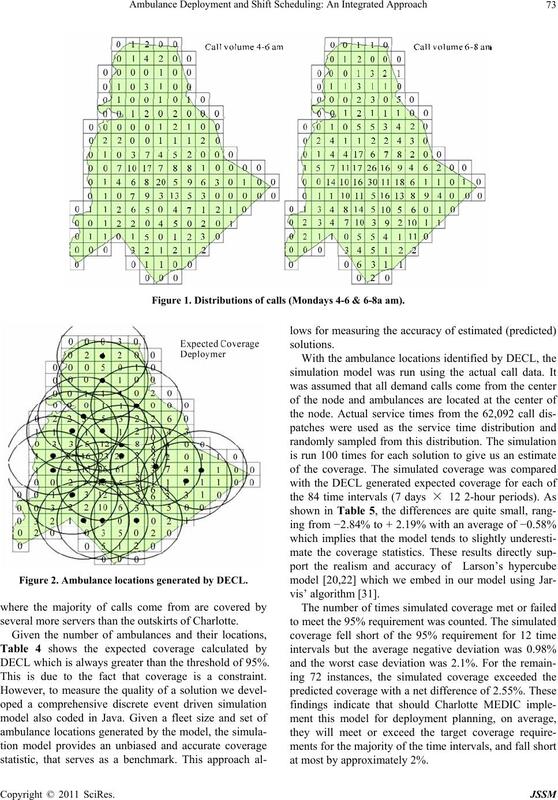 DECL generated expected coverage (%). unlikely that this scheduling solution is practical. Table 5. Net deviations in coverage (Predicted–Simulated). Table 6. 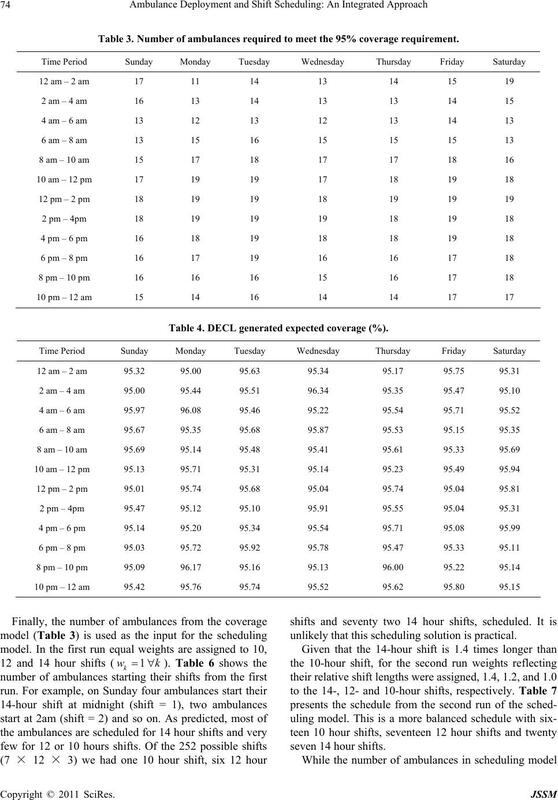 Ambulance schedule for shifts (10, 12 and 14 hours) w i th equal weights. model can generate alternative optimal solutions. Finally the slack, for the two models, is compared. Table 7. 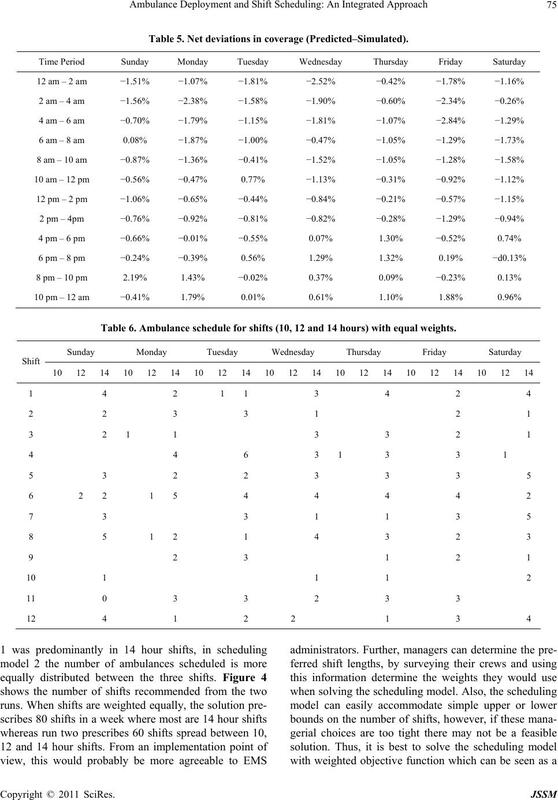 Ambulance schedule for shifts (10, 12 and 14 hours) with weights (1, 1.2 and 1.4). Table 8. Extra ambulances during eac h time per iod based from run 1.
ternative schedules to handle different situations. length preference of their personnel. commercially available EMS crew scheduling software. 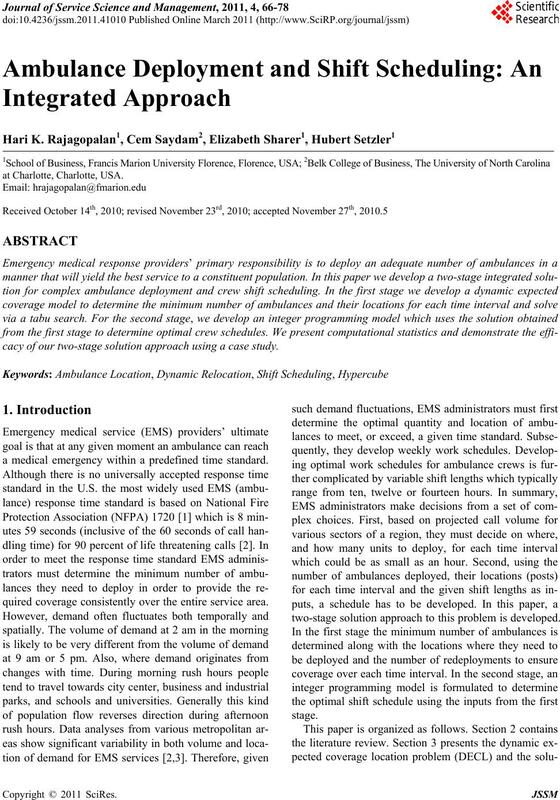 from the scheduling models generated from this work. gency Medical Services, Vol. 34, No. 2, 2010, pp. 38-42.
erations Research, Vol. 36, No. 6, 2009, pp. 1843-1851. Research, Vol. 32, No. 1, 2005, pp. 15-33. Management Journal, Vol. 1, No. 1, 2004, pp. 20-39. & Operations Research, Vol. 29, No. 6, 2002, pp. 651-665. Operational Research, Vol. 141, No. 3, 2002, pp. 480-494. Sciences, Vol. 37, No. 1, 2003, pp. 69-80. No. 12, 2001, pp. 1641-1653.
ence, Vol. 1, No. 1, 1993, pp. 25-55.
search, Vol. 111, No. 3, 1998, pp. 423-447.
erational Research, Vol. 147, No. 3, 2003, pp. 451-463. Transportation Science, Vol. 17, No. 1, 1983, pp. 48-69. 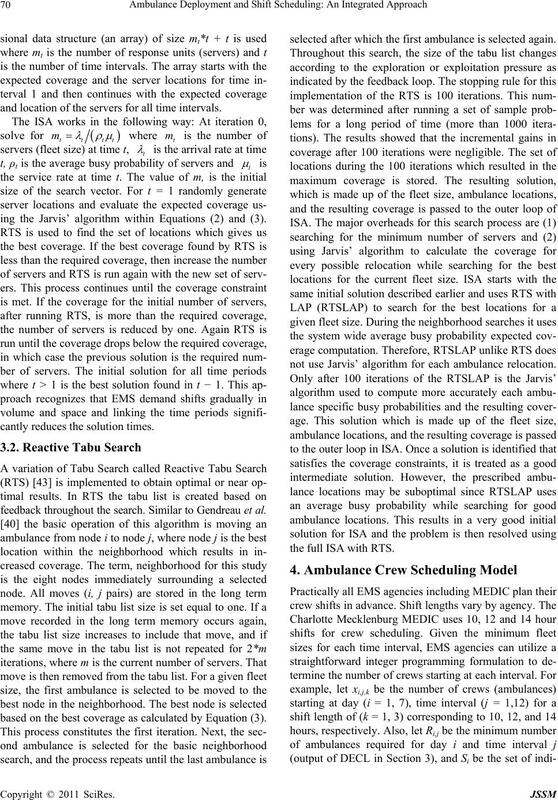 Location Problem,” Transportation Science, Vol. 23, No. search, Vol. 41, No. 1, 1993, pp. 18-36.
ences, Vol. 31, No. 3, 1997, pp. 173-189. 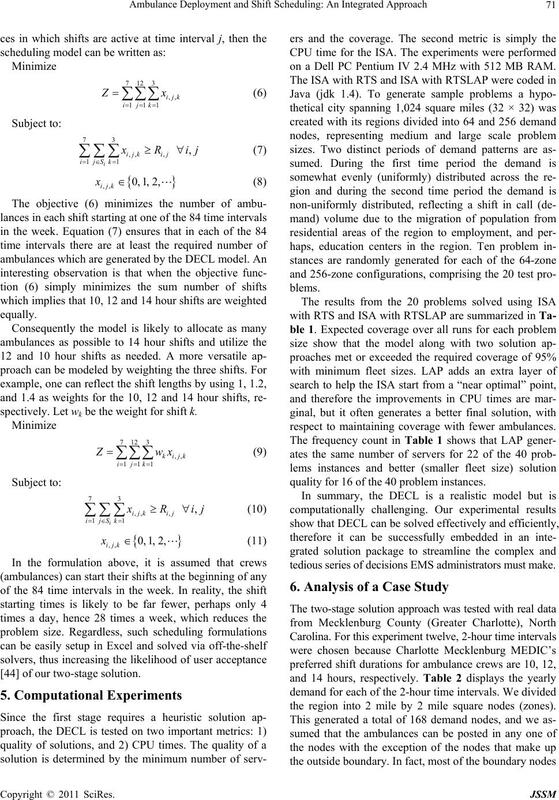 Emergency Service Systems,” Operations Research, Vol. 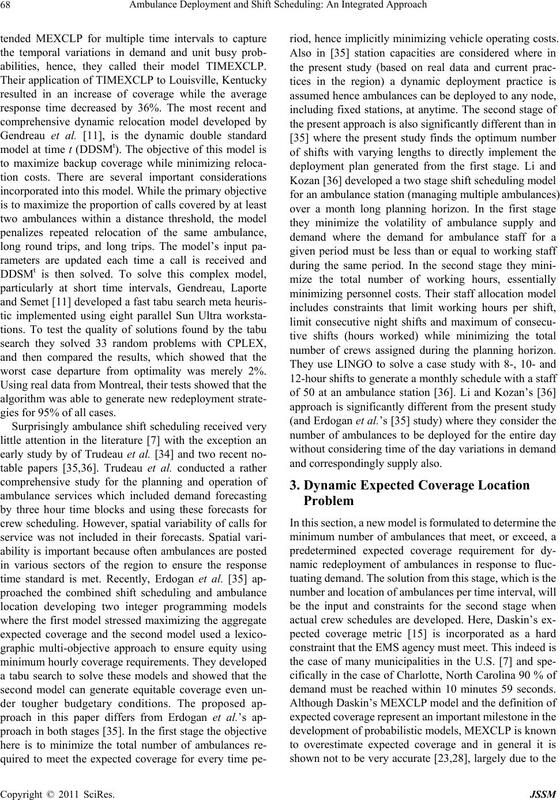 ited,” Transportation Science, Vol. 23, No. 4, 1989, pp. South Western College Publishing, Cincinnati, 2001. Wiley & Sons Inc., New York, 1995.
search,” Prentice-Hall, Englewood Cliffs, 1981. Research, Vol. 40, No. 1, 1989, pp. 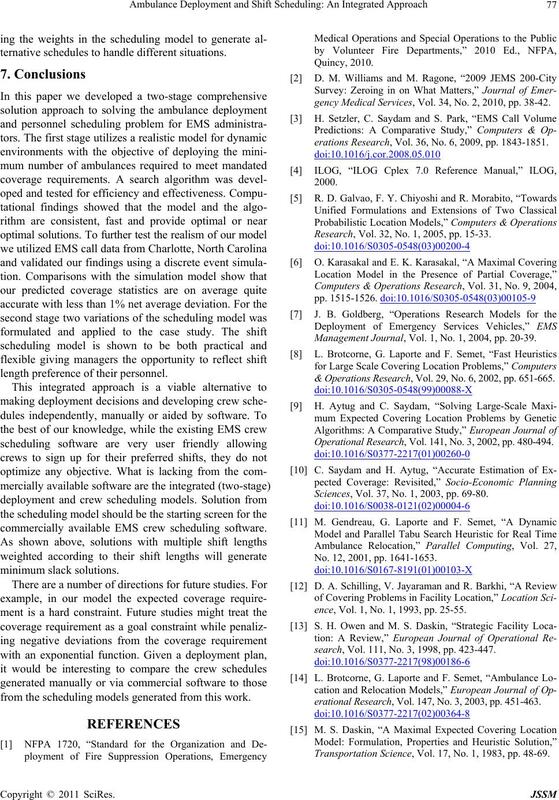 58-69.
cube Model,” Computers & Operations Research, Vol. 20, No. 1993, pp. 113-119. Computers & Operations Research, Vol. 34, No. 3, 2007, pp. 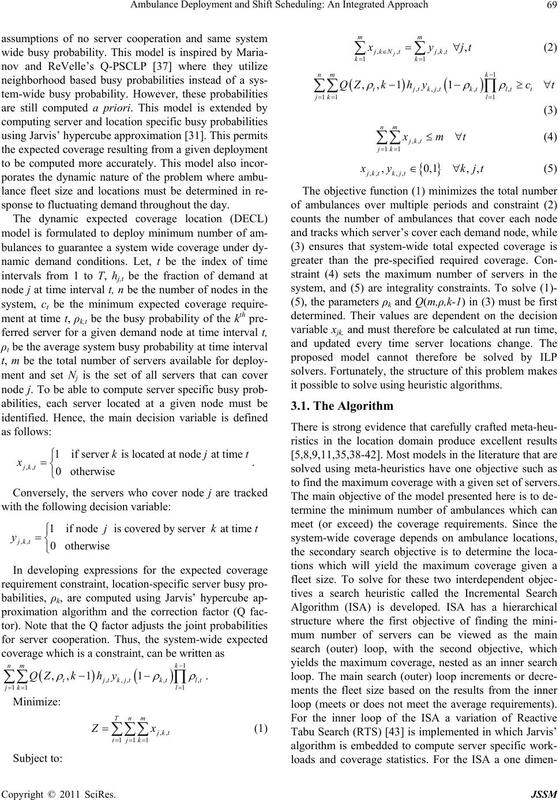 Multi-Server Loss Systems,” Management Science, Vol. tor,” H. K. Rajagopalan, 2004. Operational Research, Vol. 75, No. 3, 1994, pp. 567-581. Vol. 27, No. 1, 1989, pp. 95-113.
kyushu, Japan, 2009, pp. 14-16. Research, Vol. 93, No. 1, 1996, pp. 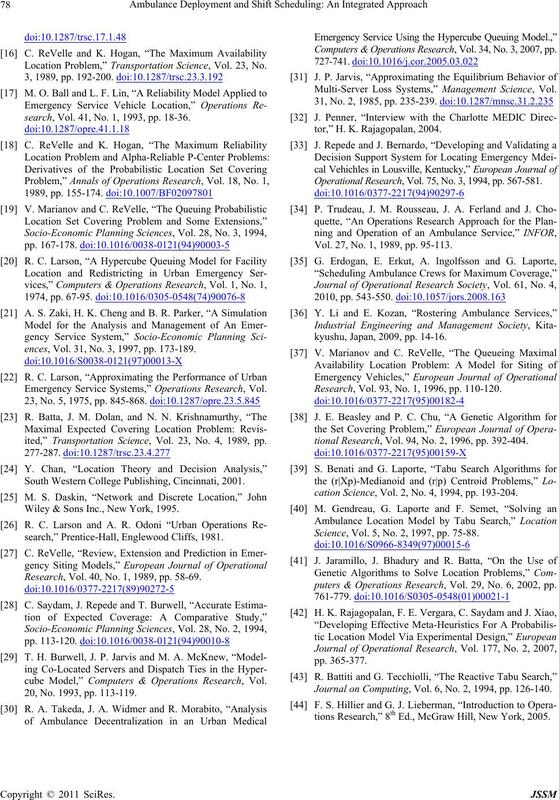 110-120.
tional Research, Vol. 94, No. 2, 1996, pp. 392-404.
cation Science, Vol. 2, No. 4, 1994, pp. 193-204. Science, Vol. 5, No. 2, 1997, pp. 75-88.
puters & Operations Research, Vol. 29, No. 6, 2002, pp. Journal on Computing, Vol. 6, No. 2, 1994, pp. 126-140.
tions Research,” 8th Ed., McGraw Hill, New York, 2005.